Last night I took advantage of another nice evening and grilled up some fish, at Yuki’s request. 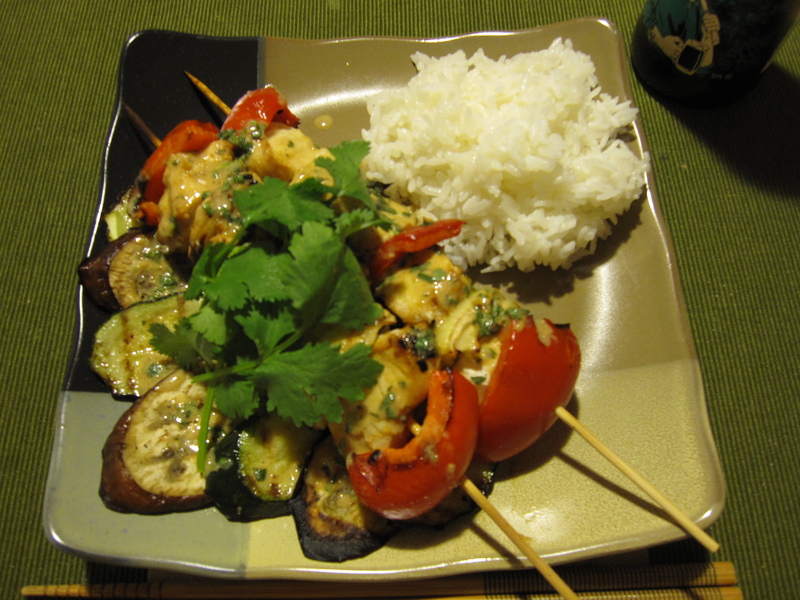 I decided to make some brochettes with Moroccan spiced cod. Any firm-fleshed fish would work for this recipe, cod just happened to be the cheapest and freshest as it just came in yesterday morning. I cut up the fish into chunks large enough to skewer for the grill. Then I mixed up a marinade that consisted of 4 chopped garlic cloves, 1/2 teaspoon of paprika, 1/2 teaspoon of cumin, 1 teaspoon of salt, 1/2 teaspoon of cayenne, about 4 tablespoons of olive oil, the juice from one lemon, and a few tablespoons of chopped cilantro. I tossed the fish into the marinade and let it sit in the fridge, covered, for about 3 hours occasionally turning. When it came time to grill I took the fish out to rest for about a half hour to come to room temperature. During that time I chopped an onion and a red pepper as well as thinly slicing , about 1/4 of an inch thick, a chinese eggplant (the regular eggplants weren’t as fresh) and two small zucchini. I also let my bamboo skewers soak in water for an hour. After all of the vegetables were cut I skewered the fish with the red pepper and onion chunks. 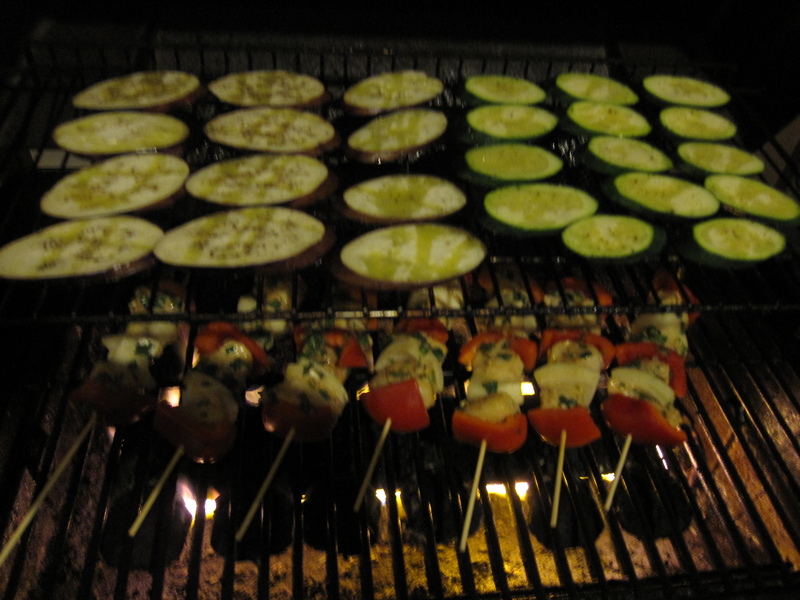 Then I drizzled the eggplant and zucchini slices with olive oil and seasoned with salt and pepper. I put the skewers on the bottom rack and the slices on the top rack. Everything was cooked at medium heat. That way the vegetables would cook at about the same rate as the fish. If the heat were too high the fish would cook much faster and the veggies would be too raw. I made a sauce to drizzle on top of everything after grilling. The sauce consisted of 2 tablespoons of tahini, 1 tablespoon of soy sauce, 1 tablespoon of olive oil, the juice of 1/2 lemon, 1/2 teaspoon of paprika, and 2 tablespoons of chopped cilantro. I served with white rice and garnished with some cilantro sprigs.